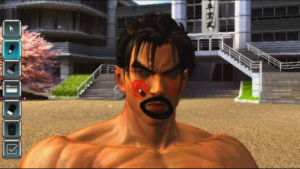 Series producer, Katsuhiro Harada was unable to confirm whether the Tekken game coming to the Wii U would be new or a port of a previous game but that doesn’t mean he hasn’t thought of what some online features of the game could be. In an interview, Harada suggested that the Wii U controller could be used to create custom stages which players could then share online. Another interesting feature that he suggested that Tekken Wii U would have is the ability to draw on your opponent’s face if you win. This idea came about because of how easy it is to draw using the Wii U controller’s touch screen. The embarassing picture that you draw on your opponent’s face could remain there for a whole year. Carry on reading for the whole interview. That’s SOOO horrible, but SOOO satisfying!!! Reminds me of Jigglypuff after she defeats an opponent. Yup, I’m pretty much dreading what people will draw on my character’s face if I lose. I guess it’s a pretty good incentive to become a unbeatable champion lol. It’ll be a port. That’s all most of the 3rd parties are good for. Yeah, I’m a cynic.